So recently, I started watching video files that had one language on the left, and a different language on the right speaker. Often times, people would simply turn off their left speaker, or right speaker, and watch the video with only one speaker. Unless you’re a big fan of, one-sided sound, this is simply not an option for me. There is a way to alter the playback so that all the left audio of the video file goes to both speakers. I use media player classic, there are probably other ways to get to the following screen, but the concept is the same. 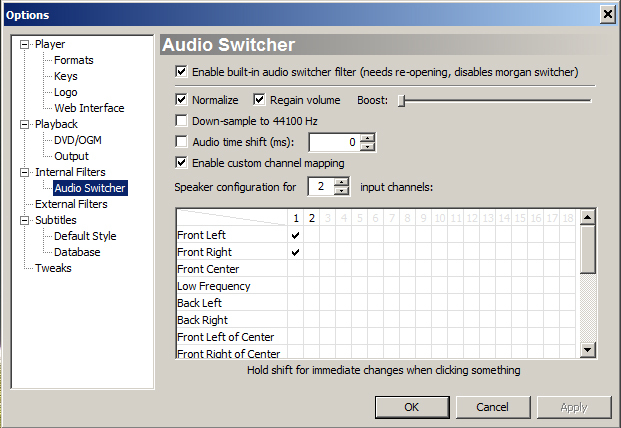 You click on view, click on options, and then select audio switcher. You’ll probably see Front left checked with 1, and Front Right checked with 2. If you check the boxes just like above, you’ll discover that all the left audio of the video goes to your speaker. Obviously, if you alter it so that 2 is checked instead, you’ll get the vice-versa. I hope enhances your video watching experience, certainly did mine. Mmm… My blog’s most recent upgrade came with an unexpected surprise. Most of the time, I don’t expect any type of cosmetic or functional changes with my blog upgrades. Why would I? Everything seems to work fine. I upgrade to keep the security exploits/vulnerabilities of wordpress to a minimal. Anyways, I’m pleasantly surprised by the navigation bar that appears when you visit your site, and when you’re logged in. There are a few workflow improvements implemented in the navigation bar. For example, I can just directly to “Add New Post” from visiting my blog while logged in. Some might wonder why is this significant, but it’s definitely significant. No longer will I have to rely on a tiny box on the right hand-side and notice tiny changes to it to know whether or not I’m logged in. I’ll have a giant bar at the top to remind me to log out. You are currently browsing the Jackson's Blog blog archives for May, 2011.